The detection of asbestos that's not properly removed can result in a work stoppage and penalties ordered by WorkSafeBC. Jul. 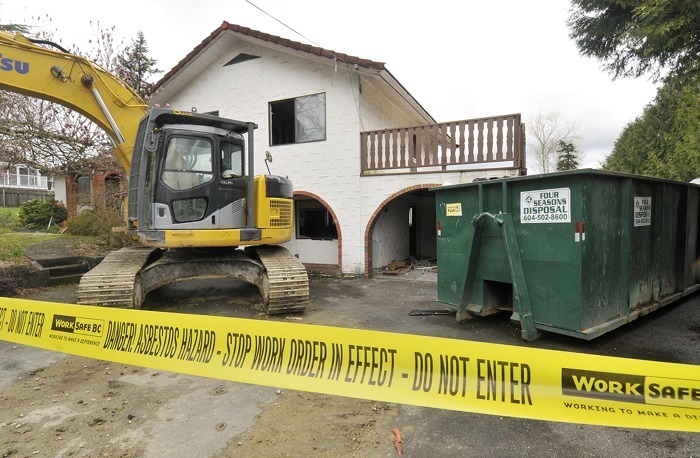 15, 2015 7:00 p.m.
An alarming number of contractors are failing to safely remove asbestos before they demolish or renovate an older home, prompting WorkSafeBC to step up enforcement to prevent a new epidemic of disease in the future. The agency conducted 210 inspections last year and found 43 per cent of hazardous material surveys were inadequate, often failing to detect asbestos that further tests proved was present. “In many of these cases they’ll produce a survey by a testing firm that shows no asbestos. We will then take samples ourselves and we’ll find asbestos in that property,” said Al Johnson, WorkSafeBC vice-president of prevention services. Disreputable hazmat firms may not check enough of a building, leaving out obvious sources of risk that can include drywall, floor tiles, insulation, cement pipes, linoleum and spray-on fireproofing. Workers exposed to airborne asbestos fibres released at construction sites can contract cancers and other asbestos-related diseases decades later. Asbestos has emerged as B.C.’s top workplace killer, with 581 related deaths in the past decade, 77 of them last year. Those deaths were mostly due to industrial exposure of trades people at high levels 20 to 40 years ago, but Johnson fears more gradual exposure in construction and demolition will be the new killer of the future. Contributing to the problem is the soaring price of land in Metro Vancouver that has fueled a boom in demolitions as hundreds of older houses are cleared away each year to make way for the dream homes of buyers. “The housing market is playing into this in a significant way because many old homes built prior to the mid-80s are just being purchased for the land and torn down,” Johnson said. Some contractors or home owners have no clue about the risks or the health and safety laws that apply, he said, while others are trying to dodge the cost of dealing with the danger responsibly. Five cities – Vancouver, Coquitlam, Port Coquitlam, Saanich and Nanaimo – require demolition permit applicants to first provide hazardous material survey results. Renovations are more difficult for enforcement officers to spot and police. Johnson said WorkSafeBC is appealing to home owners to get a responsible contractor. The enforcement blitz begins this month and continues until the end of the year. More information can be found at WorkSafeBC’s asbestos information site hiddenkiller.ca. The detection of asbestos that’s not properly removed can result in a work stoppage and penalties ordered by WorkSafeBC. Black Press file.